Recently signed to their local label, Tridroid Records, Saint Paul, Minnesota act Noble Beast has been active since 2007 with a 2010 demo having preceded this, their self-titled debut-album. Lead up front by guitarist Sir Robert (whose voice, while a little rugged at times, does a commendable job of capturing the essence of this traditional heavy metal/power-metal band) and with influences running the gamut from Judas Priest and Iron Maiden to Kreator and Emperor, Tridroid Records' latest signing is striving to hit that perfect peak and damn if they don't achieve it right out of the gate with "Noble Beast"! The first thing you're likely to notice about this quartet is how capable they are at writing memorable material. Numbers like (opener) "Iron-Clad Angels" and (personal fave!) "The Dragon Reborn" (which can be streamed at the bandcamp link below) contain so many hooks that it's almost impossible for them not to snag hold of something and pull you right in! Credit should go to fellow guitarist Matt Hodsdon (Chaos Frame, ex-Matt Hodsdon, ex-Epicurean) as, together with Sir Robert, he creates an atmosphere of epic metal proportions! The lead work of a number such as "We Burn" (which you can also stream below!) finds Noble Beast galloping into territory previously inhabited by the likes of Blind Guardian, Helloween and Iron Savior! 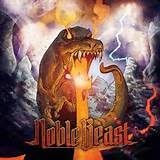 With a stud bassist like Drew Sutphen now along for the ride and with the drum duties having been split up between Jamie Strobach and David Thames, "Noble Beast" ends up being an all-killer/no-filler CD! Guests such as John Yelland (Disforia, Judicator) and George Eliassen (Shadowdance, ex-Cipher) stop by to lend a hand with backing vocals throughout this ten-track album while the song "Disintegrating Force" alone includes harsh vocals from Aaron Lott (Australis, Chaos Frame, Cold Colours, ex-Enshrined, ex-Golgotha's Pyre, ex-Sinis, ex-Solace of Requiem (live), ex-Swatara) and a wicked guitar solo from Kevin Alter of Deretla and Invidiosus fame! And it's these guests, and what they each individually contribute (as far as style choices and their own distinct influences), that turn an A project into an A+ one! Whether you're a fan of Iron Maiden/Judas Priest/Dio-infused power metal, the likes of Helloween and Blind Guardian or even more progressive-leaning acts likes Symphony X and Kamelot this Saint Paul act has something to offer making "Noble Beast" a highly recommend release!